To those of you who haven't given up on me, and keep checking my blog, thank you so much. I'm so sorry to make you wait so long between posts. I feel like I'm so behind in just about everything in my life and am constantly in survival mode, from one day to the next. But I do consider this blog to be part of my journal, so I wanted to report back about Halloween. I never heard from Dylan about his care package. I sure miss that kid. 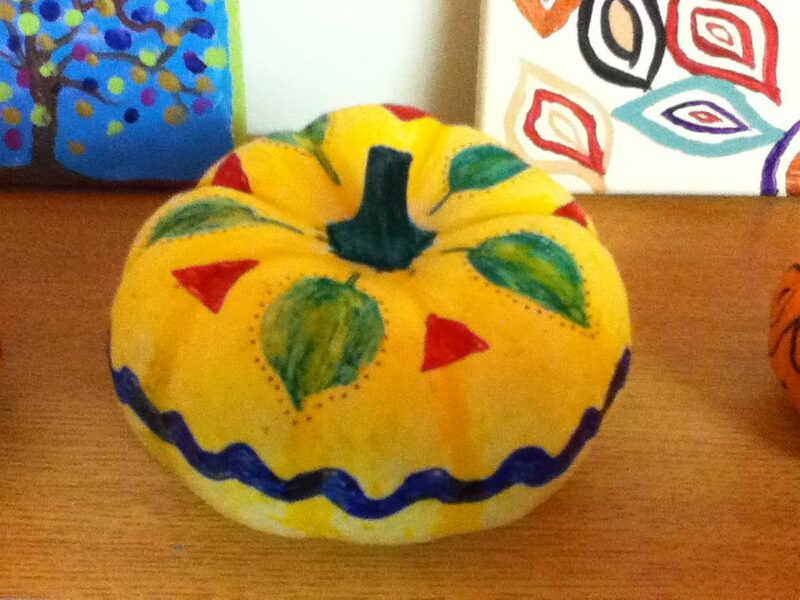 But Lyndsay was thrilled to receive hers, and she was even a good enough sport to decorate her pumpkins and send me pictures. It was a welcome Sunday afternoon creative diversion for her. 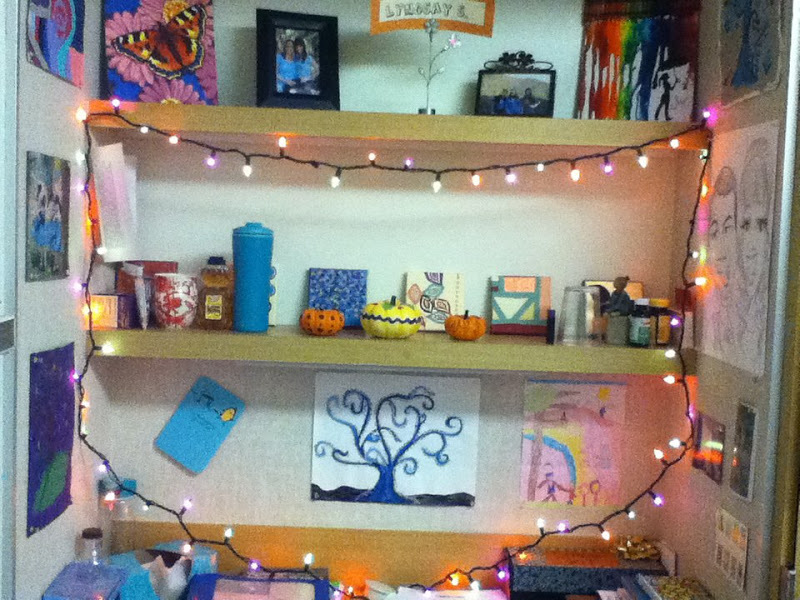 Here are her pumpkins and the pictures of her desk area in her dorm, all decorated. She's so cute. You can see all the other drawings and paintings she has up. 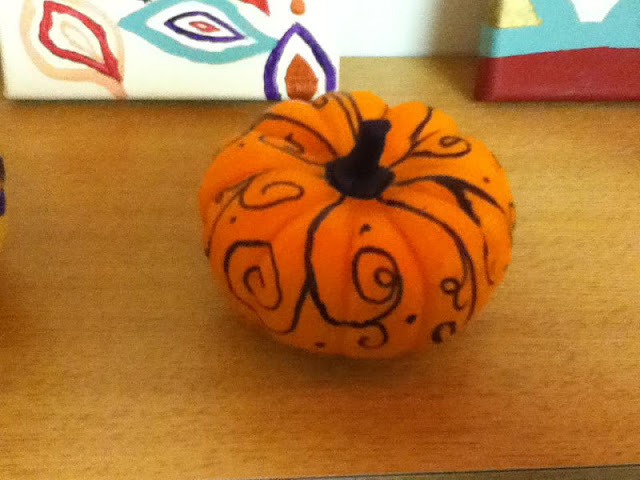 She's so creative and talented. I loved seeing her space up there, that looks so much like her. Back here at home, Aiden was a nerd for Halloween, but still so cute. We did something funny with this picture for his upcoming birthday party invitations, that I'll show you later. And little Conor was a triceratops, costume courtesy of my angel mother, who once again saved Halloween for me. I didn't know what to do, since I have zero time and no sewing machine. We got by purchasing Star Wars costumes for the boys last year, but I just couldn't do another store bought costume this year. He actually won the costume contest at his school on Halloween. He also got a serious heat rash from it though, and missed two days of school. That's a story. I'll finish with the pics of the Big Night, and then tell that one. 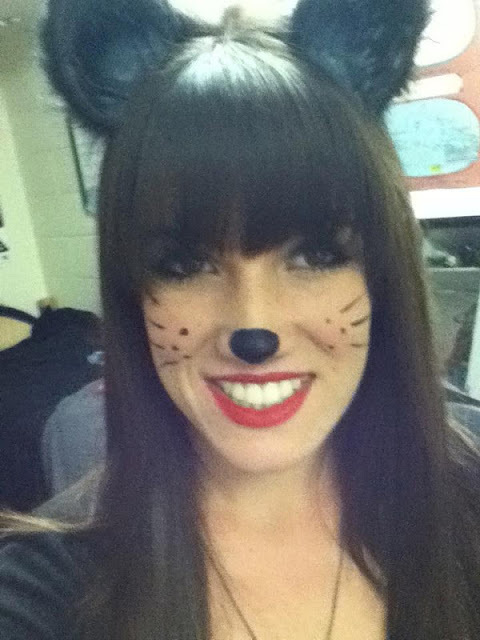 Halloween was unseasonably warm this year. That week had temps in the 90s, but the evening had cooled down considerably. 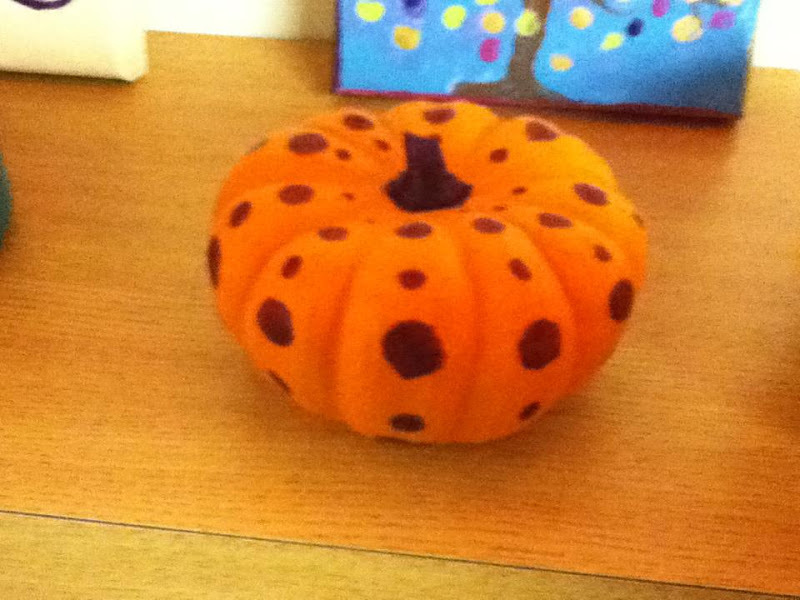 Still, by the end of trick-or-treating Conor's face was flushed and his hair matted with sweat, poor baby. The next day in school (I was at the hospital doing my clinical rotation), Adam got called to pick him up because his face was swelling and itchy and everyone was afraid it was one of his serious allergic reactions. He was given Benadryl and seemed to be fine. The next morning he came downstairs around 5:30am while I was making lunches and was scratching his face saying it was swelling up again and itchy. He had raised wheals on his face and neck and his torso was covered in a rash. I gave him Benadryl again, but knew I couldn't send him to school. This didn't seem like one of his usual allergic reactions, which go straight to his respiratory system. I thought, "Oh, great, he's got a new allergy developing." But we couldn't for the life of us figure out what it was. The Benadryl controlled the itching, but not the rash, as it usually will for a mild allergic reaction, so I called the doctor who wanted to see him. So, there went my day of studying. It's always something, I tell ya. The doctor was very puzzled too. It didn't fit his usual allergy pattern. We went round and round trying to get to the bottom of it. Then she said, "It looks like a heat rash, but it hasn't been that hot. What was he wearing?" Jeans and a t-shirt, I said. "What about the night before?" And as she said that, we both just looked at each other with recognition of having solved the puzzle. The night before had been Halloween and he was in head-to-toe polar fleece. There it was. A gazillion blocked sweat pores. Wheals formed from the scratching itself. Got it. What a relief to know the cause! She said it might hang around for 5 to 7 days, but then it would clear up. But she did want to do more allergy testing, so we headed over to the hospital for a blood draw. Conor was less than thrilled with that news, but we were so close and the day had been blown anyway, so I was not coming back. "It will be cool," I told him. "Don't you want to see how pretty your blood is?" No, not so much, but he was brave. I held him on my lap and there were two techs helping. One to do the draw, one to hold him down, somewhat. His first question to them was, "How many seconds is this going to take?" The tech told him 20. "TWENTY?" he repeated, completely shocked. "Well, that's for the first vial, and then 10 for the next, 10 for the next, and then 5." This was clearly more than he had bargained for, but I told him it only would hurt a bit while the needle went in and then not at all. Boy, did he take his counting seriously. And when it was done, I let him hold the vials and swish them around and see how lovely his blood was and told him how many things about his body his blood could tell the doctor. I showed him the labels with his name on them, to which he responded, "They spelled my name wrong. Conor only has one 'n'." He felt like a hero though, and he had been very brave. He got a milkshake on the way home. So a food allergy panel was done, and I also had them do a Celiac test while we were at it. All of that came back just fine. (relief!) He will have a skin allergy test as soon as I can work that in. His bloodwork did reveal that his iron is very low (like, it should be 23.9 and his was 7.4, but he's not anemic because his hemoglobin was normal), which is weird, because he eats really healthy foods (green veggies and lots of beans, but not much red meat), so he's getting an iron supplement for the next three months and will then have his blood drawn again. The rash lasted 3 days and was gone. Everything is fine. Life goes on. And my favorite part? Halloween is over. Poor Conor! Glad he survived it all though! And I too was very glad when Halloween was finally over. Like every year! 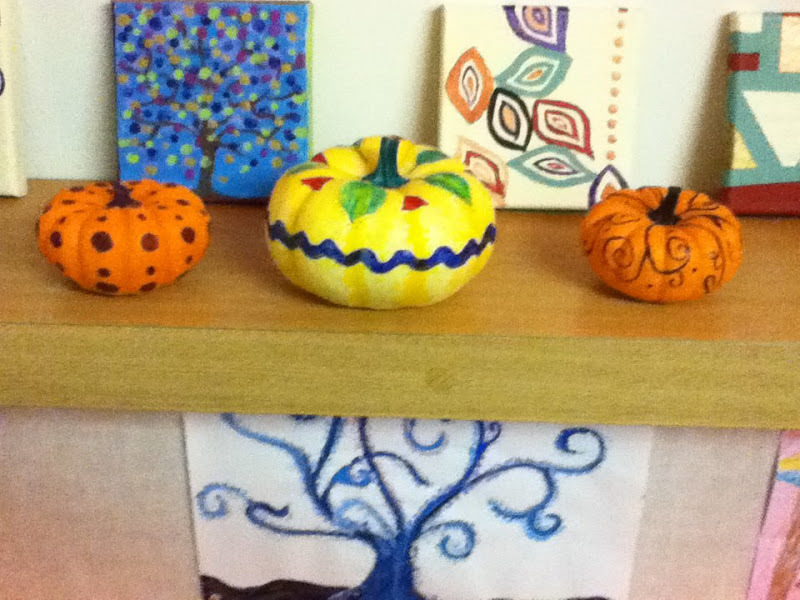 Lyndsay's pumpkins are adorable! Oh, my goodness! I had no idea. So sorry. Poor, sweet little Conor! I have been following your blog for sometime, and love reading your words very much... please continue writing.... I am so curious though; in many of your pictures you have these white drums in the background - what are they?